Stoic Week 2015 Day 2. Today’s theme is control. The quote is a shortened excerpt from Marcus Aurelius’ Meditations, in which he discusses framing your mind as you wake. We are humans, born to do human things; so instead of laying in bed, cuddled up—especially on chilly Fall mornings like here in Halifax, NS—consider that you have duties as a human and get out of bed and do them. Don’t you see the plants, the little sparrows, the ants, the spiders, the bees doing their own work, and playing their part in making up an ordered world. And then are you unwilling to do the work of a human being? 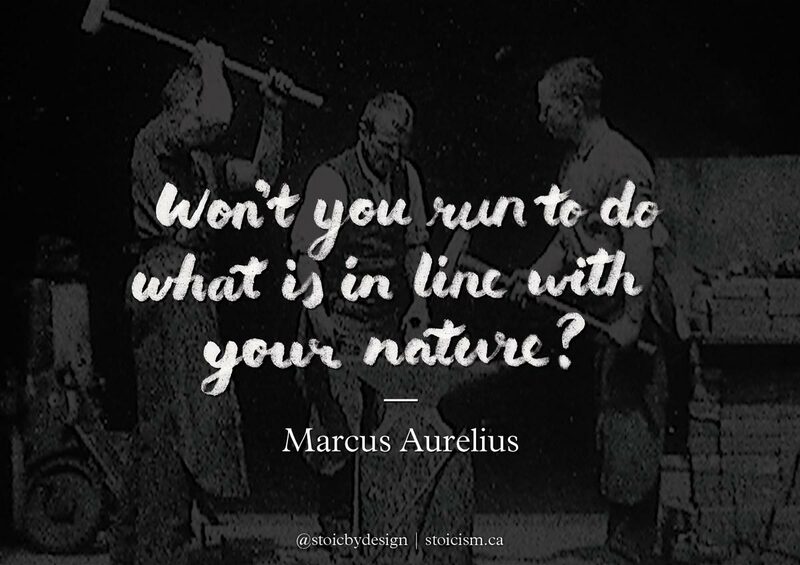 Won’t you run to do what is in line with your nature? Aurelius is much more eloquent than me; the above is a slightly longer passage from the same source comparing us to other beings that go about their business without complaint. I’d love to hear your impressions of this quote in the comments below.